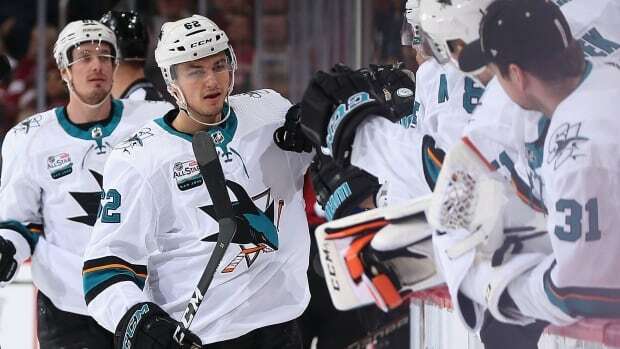 Kevin Labanc recorded his first career hat trick as the San Jose Sharks remained red-hot with a 5-2 victory over the Edmonton Oilers on Saturday. Evander Kane and Tomas Hertl also scored for the Sharks (33-16-7), who have won five straight games. Ryan Nugent-Hopkins and Zack Kassian replied for the Oilers (24-26-5), who have lost seven of their last eight overall. Edmonton has also lost five straight at home and is 2-11-0 in its last 13 games at Rogers Place. The Sharks got a break on the first goal of the game midway through the first period when a Labanc shot caromed off of defender Kevin Gravel and past Oilers starting goalie Cam Talbot. San Jose added to its lead a couple of minutes later as Kane was left all alone on his path to the front of the net to easily score his 24th goal of the season. The Sharks made it 3-0 on the power play six minutes into the middle period when Labanc rifled a shot top corner for his second goal of the game.